If you’ve ever been baffled by gifted behavior, wait until you explore your students’ brains! Learn the dynamic forces behind their needs and quirks. Don’t fall into the trap of relying on outdated stereotypes about gifted students. Join Lisa Van Gemert, M.Ed.T., an expert on the social, emotional, and academic needs of G/T students, for a refreshing, fascinating perspective on their unique challenges and traits. Lisa Van Gemert shares best practices in education with audiences around the world using a combination of neuropsychology, pedagogy, experience, humor, technology and sheer fun. She is an expert consult to television shows including Lifetime’s “Child Genius,” and a writer of award-winning lesson plans, as well as numerous published articles on social psychology and pedagogy and the book, Perfectionism: A Practical Guide to Managing Never Good Enough. 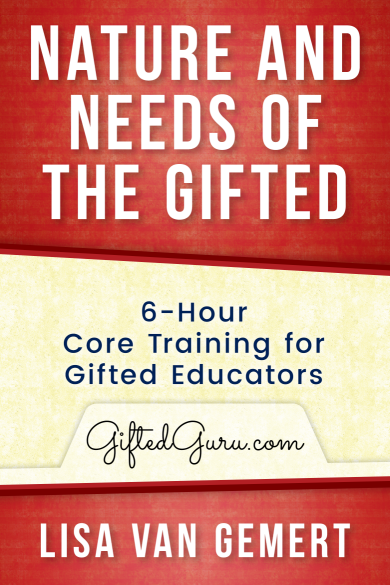 A former teacher, school administrator, and Youth & Education Ambassador for Mensa, she shares resources for educators and parents on her website giftedguru.com and is co-founder with Ian Byrd of the Gifted Guild, a professional community for educators of the gifted. Lisa and her husband Steve are the parents of three sons and live in Arlington, Texas.